The evidence of Iranian involvement in supplying Shia extremists in Iraq was meant to have been published at the end of January. It was apparently delayed because the Americans wanted to be as sure as they could be of their facts and what they could make public. They wanted, too, to show journalists physical evidence to back their case. 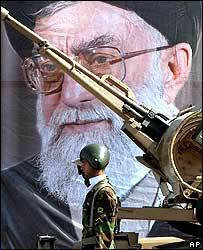 claims over Saddam Hussein's weapons of mass destruction. So, this time there was no senior member of the US administration to put the case publicly against Iran. It was a low-key affair. Three men addressed correspondents from around the world in a Baghdad briefing room. They spoke on condition of anonymity. One was a defence analyst, one a defence official, the third a defence explosives expert. On a table to their right was laid out the evidence. Weapons components, including two rocket propelled grenade rounds, mortar rounds and the unusually-titled Explosively Formed Penetrator or EFP. They could be traced to Iran, we were told. With no detailed military knowledge, it was impossible to verify the claims - that is why the explosives expert was there. He went into some detail to explain why a mortar's tail fin was of a type only known to be produced in Iran. He told us that a sophisticated machining process was required to manufacture the metal liners of the EFPs. This had previously been traced to Iran. The capability for such a process had not yet been seen in Iraq. Photographic evidence of the effects of these lethal roadside bombs was put before us. 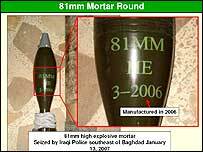 Large holes could be seen in US humvees and Iraqi police vehicles. We were told that the malleable metal liners in the EFPs form into a ball, or slug, when the explosive is set off. Travelling at a very high velocity, this is what does the damage. According to the officials, 170 coalition troops have been killed by this type of roadside bomb since May 2004. In 2006 use of this weapon nearly doubled. 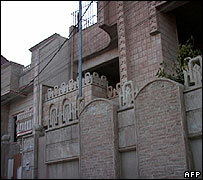 The weapons parts are said to be smuggled across the border from neighbouring Iran to supply Shia extremists. The assessment of the senior defence analyst was that the orders to do so came from the highest levels of the Iranian government. To back this claim the officials referred to the arrests of a number of Iranians in two incidents in Iraq in December and January. In one raid in the northern city of Irbil they said the Iranians were caught trying to change their appearance and flush documents down the toilet. One was contaminated with explosives residue. One was reportedly the Chief Operating Officer of the al-Quds elite unit of the Iranian Revolutionary Guard which reports to the Supreme Leader, Ayatollah Ali Khamenei, in Tehran. In another raid, the security forces said they found inventory sheets of weaponry and equipment that had been brought into Iraq. The US-led coalition must be hoping that by releasing this information their claims will be seen as credible. They will also be hoping to exert pressure on the Shia-dominated Iraqi government, which has strong ties to Iran, and many of whose leaders spent the Saddam Hussein years in exile there. As one of the officials said: "We need the government of Iraq to assert itself and make it very clear to the government of Iran that it doesn't want outside interference". It was not just the US and coalition troops who were suffering, he said, but the Iraqi security forces and civilians who were also falling victim to the Iranian-supplied weaponry.